The Negroni cocktail is a delight to the eye, handsome in a rocks glass, clear and red. It is “not for fence-sitters,” as Mark Kingwell observes in his amusing Classic Cocktails, A Modern Shake . A proper Negroni is fully one-third Campari, and that’s a lot of Campari by anyone’s reckoning. That bitter astringence is an acquired taste, and after the first sip you already know that you want to learn more about it, or you swear off forever. I’m reluctant to accept the standard lore that the drink was invented in post-WWI Italy, since it doesn’t appear in cocktail manuals until mid-century. According to Gary Regan’s The Joy of Mixology , it shows up in a couple of 1955 manuals; there is no mention of it in the 1932 Savoy , nor in the 1958 revision of Embury’s Art of Mixed Drinks . The story of the famous Count Negroni may be as much a product of brilliant Campari corporate PR as of historical fact. There is a predecessor to the Negroni called the Camparinete. Its first publication was in Boothby’s 1934 World Drinks and How to Mix Them. Boothby’s formula called for an ounce of gin to half-ounce each of Italian vermouth and Campari. The modern formula for the Camparinete is usually the same as the Negroni, equal parts of each ingredient. CocktailDB lists a slightly amped 4:3:3 formulation. If you google “Negroni,” you’ll find any number of blog comment chains that complain about bartenders that ramp up the gin portion from the standard equal-parts formulation, on the apparent reasoning that the customer couldn’t possibly have meant to order something with that much Campari. I have sampled up-ginned versions, particularly the 3:2:2 that David Wondrich recommends in Killer Cocktails ; to my taste, the extra gin muddles the flavors and unbalances the drink. Perhaps it would be okay if I found the right gin, but for now I’ll stick with equal parts. 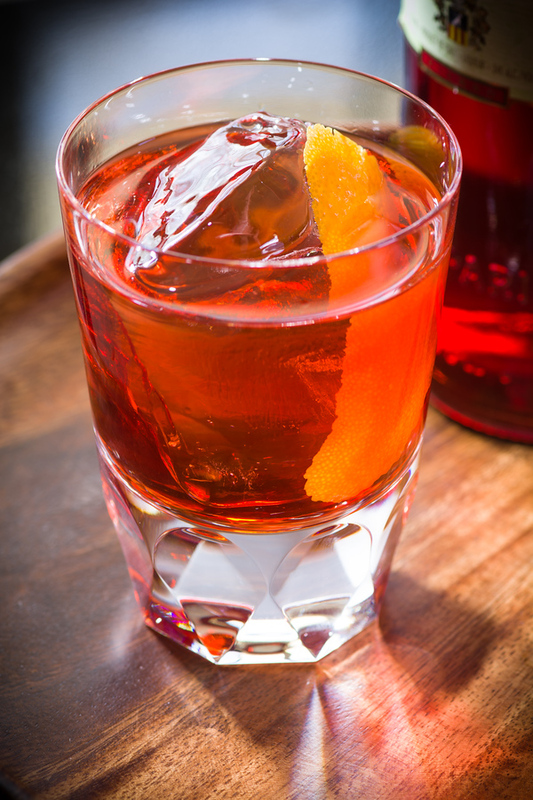 The Negroni can be served up, in a chilled cocktail glass; or in a rocks glass, with or without ice. There are some who say you should garnish with a lemon twist, but orange is the more traditional Campari accompaniment. Dale DeGroff recommends flaming the peel in The Craft of the Cocktail . Stir with ice; rim a chilled rocks glass with orange, add ice, and pour the chilled mix. Flame the orange garnish and add to the glass. I have a long-standing preference for very traditional, middle-of-the-road London dry gins like Bombay Dry and Beefeaters, but the Negroni seems to welcome some of the newer infused gins. I’m thinking particularly of a Negroni made with Hendrick’s gin, served at Harvest in Madison WI. The cucumber nose of the Hendrick’s added to the complexity of the drink, and seemed to open up the tightly-wound Campari, lightening the flavor pleasantly. “The Negroni Cocktail” at cold-glass.com : All text and photos Copyright © 2010 Douglas M. Ford. All rights reserved. This is my first-ever Negroni that I’m drinking, right now. You were definitely right, Doug. I’ve had 3 sips and while I can’t proclaim it my most-favorite drink of all time, it’s certainly something that I’ll be playing with proportions in. Admittedly, it’s my first-ever venture into Campari and vermouth of any kind, and I’m just taking this summer to learn about the nuances of drinking and mixing gin, but it’s definitely got a memorable aspect to it. Thanks a lot for the recipe, Doug. It’s got me started on this one. Cheers! That’s very fun that you’ve set such a project for yourself. And Negroni is certainly worth some experiments. The Negroni is a funny thing—it’s either the only cocktail you can imagine yourself drinking this evening, or it’s the farthest thing from your mind—as you seem to have already discovered. Yes, there are some very unfortunate Negronis out there, alas! I’ll remember to try Miller next time, thanks for the idea. My friend John, ever the tinkerer, makes a Grapponi. Substitute the gin for Grappa. Interesting substitute. I’ve never been a big fan of grappa, but I can see how it might work well with the Negroni. Thanks for the idea! What is your opinion of Punt e Mes for the vermouth? I made a Negroni a few nights ago with that and Bombay Sapphire. After several weeks of obsessing over Saratogas and Boulevardiers and the 1795 (I love ’em! ), encountering the mix of gin with the Campari again was … well, I think I heard angel voices. Interesting question, Dennis. I finally got a chance to compare a vermouth version side-by-side with a Punt e Mes vesion. The Punt e Mes works very well, and is only barely different from the vermouth version, with just a bit more earthy, slightly bitter orange pith notes alongside the Campari. There is also a pleasant hint of some other herb that I can’t identify—I wish I were better at flavor identification. I’m glad you enjoy the Negroni, and that you took time to ask this question—I don’t know that I would have tried the combination otherwise, and it’s a good one. Thanks. I loved this piece – always fun to blow popular myth out of the water! I’m researching the Negroni and would love to know what your source was for “There had been a gin-heavy Campari blend called the Camparinete since the 19th century” as I can’t find a recipe that early. I seem to be very busted on this “19th century” reference for the origin of the Camparinete. For the life of me, I can’t figure out where I found it. I think I must have misread something, or read extra meaning into some reference that didn’t really say that at all. In fact, the earliest explicit published reference to the Camparinete seems to be from Boothby in 1934, which is probably a reference you’ve seen already. Thanks for taking time to point out this discrepancy. I’ll edit immediately. That’s intriguing. My copy makes no mention of the Negroni. I’m fascinated how that works. I’ve seen so many recipes—for food, drinks, whatever—that look like they simply cannot work, will make an aweful mess. And yet, they somehow turn out as astonishing winners. I wish I knew enough to forecast those successes in advance. I’m glad you enjoyed the Negroni!